After Patricia Field, Manolo Blahnik and Matthew Williamson, Chanel creative director Karl Lagerfeld has now also collaborated with Coca-Cola and 'designed' a limited edition aluminum Coca Cola Light bottle. As much as I want to like all things Lagerfeld, I just can't get excited about him creating a package design for something as cheap and tasteless as Coca Cola Light. Yes, Coca Cola is an iconic brand, but since they changed the recipe to something beyond recognition from its delicious original product I just can't think about anything but that disgusting high fructose corn syrup taste for the normal Coke, and the taste of chemicals for the light version. Anyway, for those of you that might be interested (I'm thinking about my friend Merle, who basically lives off Coca Cola Light): the limited edition bottles will be up for grabs as of April 28th at Colette (of course). 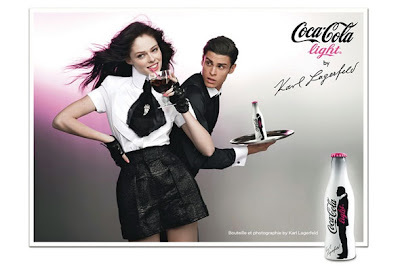 The ad campaign, which Lagerfeld shot himself, features models Coco Rocha and Baptiste Giabiconi. The image shows Rocha coyly sipping the fizzy drink from Lagerfeld's favorite pimp cup Lalique glass, while Giabiconi looks like he's got the actual bottle up his arse. And even though Rocha looks cute in Karl's gorgeous designs, her hair looks like a burnt down village. Couldn't they have fixed that? All in all the whole thing looks kind of cheap and targeted at teenagers, who will definitely have to save up in order to shell out $5 for a bottle and $80 for the box set which holds a bottle and a bottle opener. 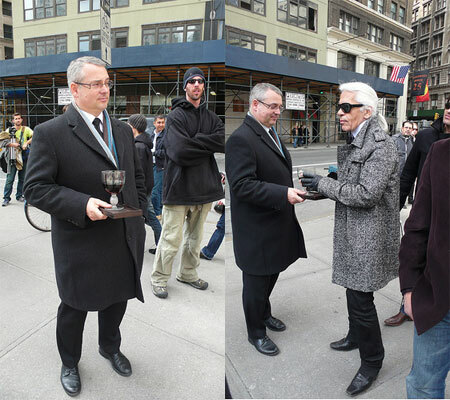 One last fun fact about Lagerfeld and his love for Diet Coke: he actually has a butler for the stuff (see below)! My verdict on this whole collab: C'mon Karl, stick with Chanel... it's what you do best!